Time and time again, research has shown that an important part of living well and aging well is staying active as often as possible, for as long as you can. 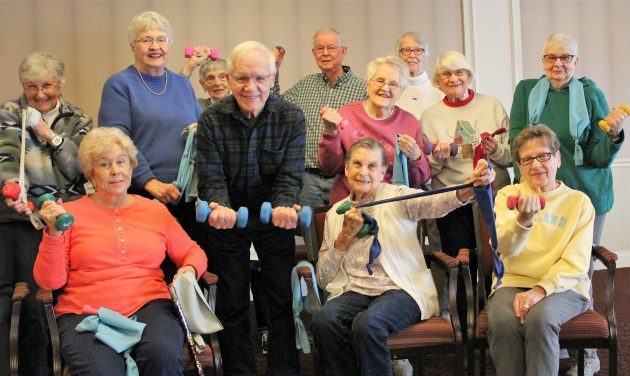 Exercise is good for your overall health at any age, but for older adults it can improve your mind, mood and memory which can help you maintain your independence, manage pain or symptoms of illness and even reduce the risk of injury. For people with arthritis or osteoporosis, low impact exercises like yoga and swimming are recommended as they include fluid movements, are less risky to perform and are not harsh on the body. Chronic pain and health concerns that limit your mobility can certainly affect the types of exercise programs you’re able to do easily. But don’t despair, there are a variety of exercises available that don’t require a gym and allow you the frequency you need to experience the physical and holistic benefits you’ll love. If exercise is not a regular part of your routine, you should first consult your physician before starting a new exercise program. Low impact exercises are a great way to include physical activity in your regular routine as they can stretch and strengthen your muscles, help prevent injuries, reduce stress and even lower your blood pressure. There are four key areas that low impact exercises improve: balance, strength, flexibility and endurance. By including all four of these areas, you’ll reap the full benefits of staying active, improve your mental and physical health, and inject variety into your routine to ensure that boredom doesn’t set in. As you look to start your new exercise routine, consider these five exercises. Chair exercises provide a better workout than one might think, as they work to improve your range of motion, strength and muscle tone all while burning calories. This type of exercise is ideal for older adults as the chair offers stability if balance is an issue. Chair exercises also allow for safe stretching and can help reduce the risk of falls and injury. Yoga involves a series of breathing exercises and body postures that help with flexibility, balance and endurance. Additionally, it can improve your respiration, reduce anxiety and encourage you to be mindful of your thoughts and emotions. A regular yoga practice also improves core muscles, which aids in coordination and stability. Stretching is a simple thing that provides important benefits, especially for seniors who often experience muscle and joint weakness and a change in their range of motion. Easy stretches done on a regular basis increase the circulation of blood flow and lengthen muscles which help to reduce the risk of injury. Light weights and resistance bands, when combined with a good endurance exercise like walking or even swimming, offer great benefits. As we age, loss of muscle strength makes it difficult for us to perform simple tasks like stooping, kneeling and reaching. Try combining hand weights while walking, or resistance bands with yoga or stretching exercises for a full body workout. Walking is an easy endurance exercise to add to your weekly routine. It takes little planning, is easier on your joints and can be done at any age. This low impact exercise builds endurance, gets your heart pumping, and is flexible – you can do it indoors on a treadmill or outside on a walking trail. A couple of key things to keep in mind when you start your walking program: wear comfortable, supportive shoes and be sure to do stretches before and after your walk to wake up and cool down those muscles. At Silver Maples we feel strongly that variety is the spice of life — and your fitness program too! With an on-site exercise room, in-house instructor led classes and a free membership to the Chelsea Wellness Center, you’re sure to find an exercise program that’s perfect for you and your lifestyle. We’re passionate about creating and supporting a positive aging experience which includes health and wellness opportunities for our residents. Our programming and wellness staff is certified by the American Council on Exercise and National Exercise Trainers Association, and plan a variety of programs for all fitness levels. We invite you to stop by and see Silver Maples for yourself – you won’t regret it! If you’re still in the research phase and aren’t quite ready to visit, we encourage you to get to know us from afar by visiting our website. There, you can view our videos and read personal stories and testimonials shared by our residents, their families and our staff. You can even request more information to receive our brochure packet full of great information. Or, feel free to connect with us through social media to get a peek at daily life at Silver Maples. Contact us when you’re ready to learn more, we’re eager to discuss options and help you enjoy a lifestyle and support system you and your family will love. There’s never a dull moment in our retirement neighborhood! Check out the latest Silver Maples news, interesting blog posts, and events that are open to the public. National Write Your Story Day! We invite you to sign up for our email updates which include our latest news, blog posts, special events, and more! Would you like to receive news and updates from Silver Maples?